•The patented true floating head and Classic XP™ reel combine to produce Jacobsen's legendary quality of cut. 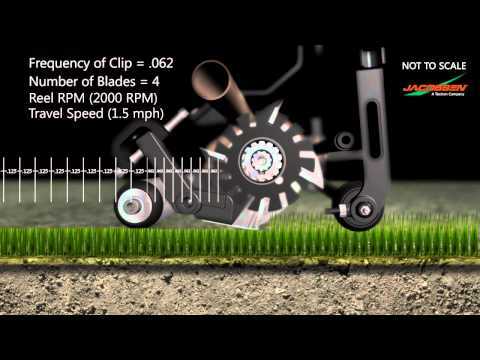 •Delivers industry leading productivity with a maximum mow speed of up to 3.8 mph (6.12 km/h) while maintaining the tightest frequency of clip. •Password protected LCD menu allows you to set the frequency of clip, mow speed and other settings to customize mower to course conditions. •Available Models: ECLIPSE2 118 Hybrid and Electric, ECLIPSE2 118F Hybrid and Electric, ECLIPSE2 122 Hybrid and Electric, ECLIPSE2 122F Hybrid and Electric, ECLIPSE2 126 Hybrid and Electric. ECLIPSE2 118 Models: 18 in. ECLIPSE2 122 Models: 22 in. ECLIPSE2 126 Models: 26 in.